I’ve joined tons of Jane Austen fans over at Roof Beam Reader this month for the annual Austen in August read along. This is a reading challenge that encourages you to read one or more of any of Austen’s works, or works about Austen. Then you share your thoughts in a blog post or join in by commenting on what others have posted. I’m so excited! There’s no better way for me to tackle a title on my To Be Read list than for someone to suggest that a whole lotta people join in and read along with you. Two of my favorite things are large groups and talking about books so this was a win-win for me! It’s my Inaugural Austen and I am reading Northanger Abbey. Northanger Abbey is Jane Austen’s first novel though it wasn’t published until after her death. I must admit that I had never even heard of it until a few years ago when I saw “The Jane Austen Book Club,” a movie adaptation of the novel of the same name. In the movie, five women and one man decide to read six Austen novels in six months and hold a book club meeting for each one. Grigg, the lone male in the group is an adorable, enthusiastic reader. His book choice was Northanger Abbey and when it was his turn to host the meeting he decorated his house in a spooky theme to match the book. Now ya’ll, I know that he is a fictional character but I think that he could be my hero. So, lovable fool Grigg, as he was captioned in the photo below, is basically the reason I chose Northanger Abbey for the read along. Northanger Abbey is about a young girl named Catherine Morland. She is around seventeen years old and that makes her of suitable marrying age. She enjoys reading novels, something looked down upon in her day as a way to spend time. (Not the reading, but the reading of novels). She is particularly fond of Gothic stories full of murder and mystery and such. She’s a bit shy and socially awkward but eager to learn the art of the socialite. Her mother and family do all they can to instill manners, beauty and feminism into her. When given the opportunity, they allow her to go to Bath for a few weeks with family friends. Bath is apparently the closest location with a social scene. Here, young people attend Balls, Theater, and they have a general hang out area called The Pump Room. This is where they meet friends, companions and dance partners. And this is where Catherine meets Henry Tilney. They dance for the acceptable two dances, chit chat and Catherine is smitten. Meanwhile, there are others who would like a dance with her. The brother of her friend Isabella for one. And here is where all the angsty angst begins. Catherine’s brother James likes Isabella. Isabella’s brother John likes Catherine. Catherine likes Henry. Catherine is pleasant to John and unaware of his hints and advances as she waits for the next time she can catch a glimpse of Henry. (Anyone feeling any Middle School angst yet?) When she finally realizes John’s feelings for her, (and he is quite “schemey” about revealing it), she is distraught but determined to let him know in the nicest way possible, that her feelings are not mutual. Thank goodness, around that time, she is invited to go spend a few weeks at Northanger Abbey, the home place of the Tilneys. Henry’s sister Eleanor is a good friend and companion to Catherine and together they spend their days walking the grounds, touring the Abbey and having tea and such. All the while, Captain Tilney, the widowed father to Henry and Eleanor, is observing Catherine daily, hoping to find her to be a suitable match for his son. Catherine allows her imagination to get the best of her while staying at the Abbey. She finds Captain Tilney’s behavior to be strange and before you know it she is imagining that he is the reason for the death of his wife. Perhaps he murdered her or perhaps he is holding her hostage, alive, somewhere in the basement. But it is not long before her crush sets her straight on these matters and she is utterly humiliated. More humiliation comes later but then finally happiness! The timeless and universal themes of love, friendship, honesty, greed, contentment and family relationships make Northanger Abbey a story worth reading. I encourage you to pick it up, get to know Catherine, meditate on the time when cell phones and TVs didn’t exist. Contemplate a time when the biggest thing you looked forward to was sitting with a friend for a few hours. Maybe you do that now, but how much time do you really have? If you desire a slower pace, even for a few days, even if it is only in your imagination, Jane Austen can assist you with that. Hey, is there an App for that?? Hey Darlene! So Northanger Abbey is one of my two remaining unread Austen novels. I’ve also read The Jane Austen Book Club, and I LOVED that guy! 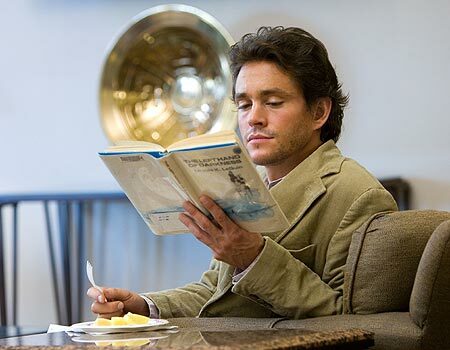 The part that got to me was when he searched out and read the random novel Catherine was all obsessed with. Now that’s commitment! Yes! I remember that well! All the other ladies in the group were impressed too! I think I will read Pride and Prejudice next but who knows when. Maybe next August??? Thanks for linking up, dear!